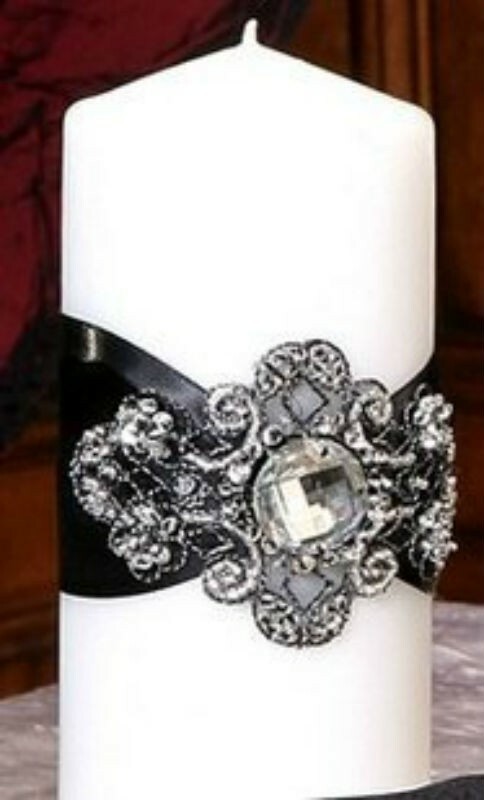 This unity candle is exquisitely detailed with hand beading and metallic thread with a faux diamond in the center. The white has silver thread and beading the ivory has gold thread and beading the black has silver and pewter thread and beading. Available in white ivory or black..
Our decorated 9-inch pillar candles are also a great choice for decorating a sweetheart guest book or cake table. A beautiful and memorable wedding can start from the smallest detail or idea which then turns into a mood or theme that represents you. Our collections make your wedding come alive with coordinating accessories to enhance any wedding.